Jardín de 500 m² con piscina climatizada 50m3 piscina. la casa se encuentra junto a un gran parque. A 10 minutos del puente de la Isla de Ré, esta casa es las vacaciones perfectas para iniciar sesión en una zona tranquila y con recursos. a menos que prefiera relajarse y barbacoa en la piscina, ir de compras en el centro de la ciudad, caminando bajo las arcadas, buenos restaurantes y que sin duda le recomendaría. Une bien jolie maison très agréable pour y passer de belles vacances. La maison est très bien équipée, bien entretenue et les hôtes charmants. Beautiful property, ideal location, so much to do in the area. Perfect for families, and couples. This was our first family holiday, so it was really important we picked the perfect location and place to stay. We really did! We were welcomed by the owner in a friendly manner and we were given thoughtful information about things to do and places to visit in La Rochelle. We had a major drive to get there, and ended up late due to getting lost, the owners were understanding to this and made us feel welcome when we arrived. 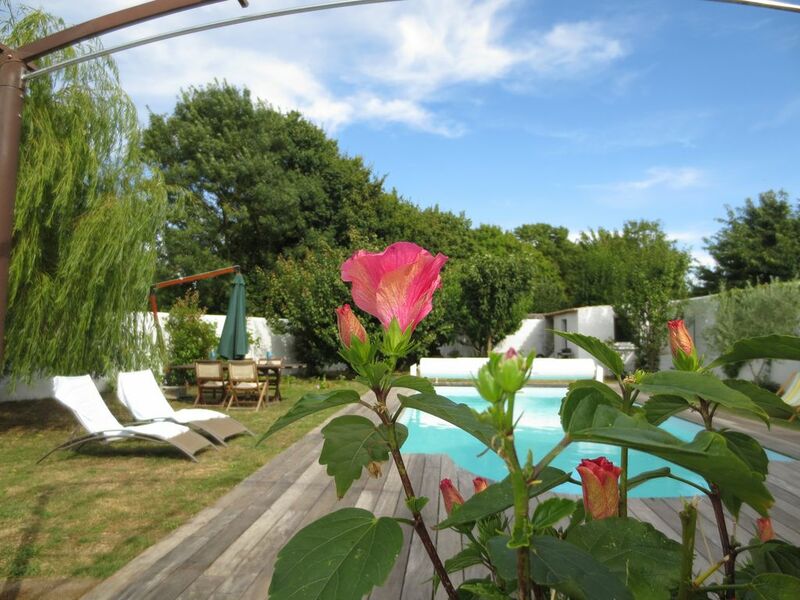 The property was private, a perfect size for our family of four, beautiful garden, bbq, and swimming pool. We could access a local supper market, bakery and the town of La Rochelle easily. My husband and I found the property was just what we wanted, great fun for the kids and romantic for us to relax and enjoy the holiday experience. We have no complaints about any of our holiday. La Rochelle has so much to do for families, the natural history museum, Aquarium, markets, restaurants and historic buildings and much more. Our holiday was truly wonderful and we really had an amazing holiday! Very comfortable house. Well situated in a quiet area. small to sleep well with two adults. Nevertheless we recommend this house for holidays. Nous sommes heureux d'avoir pu vous procurer une grande satisfaction lors de votre séjour. Nous vous remercions également de la qualité de restitution de la maison de votre part et au plaisir de vous accueillir prochainement. Positivster Punkt ist die angenehme Lages des Objektes , jedoch weißt das Objekt erhebliche Mängel auf ! Angefangen vom verschmutzten Geschirr im Schrank , über nicht verschließbare Fenster , Defektes abgewohntes Mobiliar , Bishin zum vermüllten Garten ! Um nur einiges zu benennen ! Besprechung über Fewo direkt erfolgte! Schäm dich Herr KIEFER für diesen lächerlichen Kommentar! Alle unsere Mieter sind begeistert von der angenehmen Umgebung und Wartungsebene (innen wie außen) das Haus. Unser Haus verfügt über einen Herd Klavier und hochwertige Materialien ausgewählt wurden, das ganze Haus zu entwickeln. In 4 Jahren sind Sie derjenige, Unzufriedenheit zu zeigen. Wir freuen uns, das Glück eines jeden unserer Mieter zu jeder Jahreszeit zu beteiligen! La maison correspond parfaitement à l'annonce et parait même plus grande que sur les photos. L'accueil chaleureux et le calme du voisinage n'enlèvent rien à cette bonne impression. A noter seulement que la piscine n'est chauffée qu'à partir de mi-juin, et n'est donc pas praticable avant. Bref, nous recommandons ! Usted puede elegir entre los días de playa en La Rochelle o la Isla de Ré; descubrir magníficos lugares (Ile d'Aix, Fort Boyard, Oleron Island, Costa Salvaje, ...); alegría de compartir actividades familiares (paseos en bicicleta, Zoológico Palmira, La Rochelle Acuario, varios museos, acrobranches rompecabezas castillo para niños, mini-golf, ..); por no hablar de la posibilidad de practicar deportes (club de tenis y club de equitación cercana).